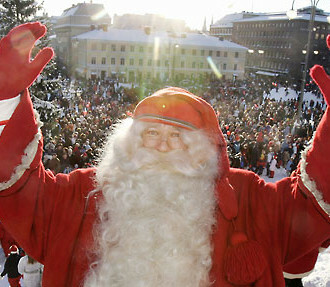 All systems go: Santa visits Senate Square in Helsinki, to the delight of both kids and grown-ups. 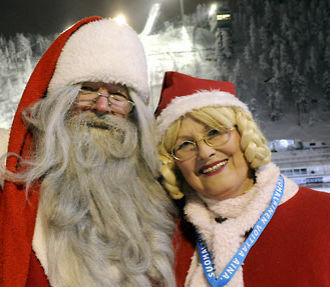 Santa Claus is the great hero of the Finnish holiday season. 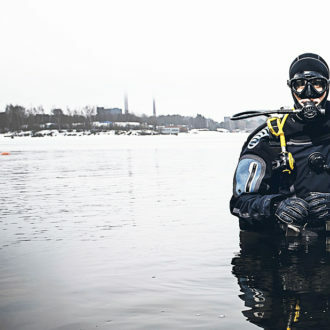 As just about everyone knows, he lives in northern Finland and helps spread the joy of Christmas all over the world. Korvatunturi, the mountain in Finnish Lapland where Santa Claus makes his home, lies 1000 kilometres north of the capital, Helsinki. He lives there with his wife and hundreds of elves. From the top of Korvatunturi, they can hear the Christmas wishes of all the children in the world. For Finnish kids, the countdown to Christmas begins during Advent, when the streets are decorated. Children and adults alike have fun opening windows on Advent calendars, one window a day until Christmas Eve. Usually the windows reveal light-hearted Christmas pictures, although the flaps sometimes conceal chocolate or other small gifts. During Advent – and other times of year as well – Santa may have time to appear and spread Christmas cheer in towns around Finland and beyond. 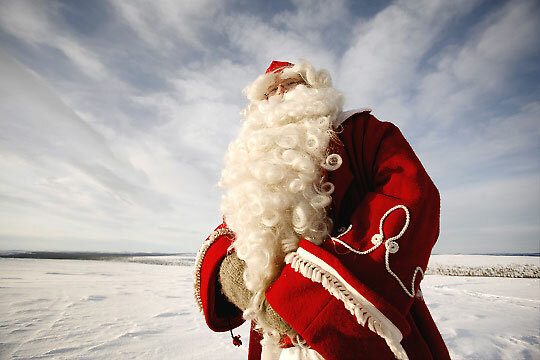 People often ask him about the elves he works with, and in warmer countries folks also want to know about reindeer – and snow. There’s lots of snow in Finnish Lapland from November until late spring – sometimes even until May. How does Santa answer people’s snow questions? He does his best to describe snow and cold. Snow is a white, flaky substance composed of ice crystals. You can make it into snowmen, snow castles, snowballs and snow sculptures. And when snowflakes float dreamily through the air to the ground, that’s a beautiful winter day. Temperatures may drop below -30 degrees Celsius, so the snow crunches beneath your feet as you walk and the joints of the log houses creak. But, surprisingly, compared with southern Finland, Lapland doesn’t feel so cold. The frozen sea of the south and the snowy fells of the north make the cold feel different. Snow makes it easy for Santa to transport the presents. He glides lightly over the snow in a sleigh drawn by prancing reindeer, with Rudolph in the lead. Santa’s most famous reindeer is Rudolph the red-nosed reindeer, of course. But Santa could never make the journeys to every home in the world with only one reindeer, so Rudolph is just one of many. All of the working reindeer are males that weigh around 100 kilograms each. They’re strong enough to pull Santa Claus and a sleigh full of presents over long distances. Rudolph is especially important because his red nose provides light on the dark yuletide evenings when Santa has to travel. Reindeer calves are born in the late spring weighing about five kilograms. They grow very quickly, feeding on lichen. In the autumn, they eat the tasty mushrooms that grow on the northern Finnish fells. 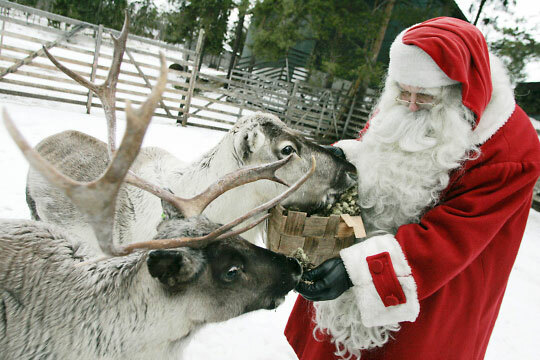 Tourists who visit Lapland can experience a ride in a reindeer-drawn sleigh. It’s a lot of fun when the snow whirls up as the reindeer pull you along. Santa lives a peaceful existence at home when not delivering presents or making public speaking appearances. He, Mrs Claus and the elves eat a lot of salmon, porridge and tasty local berries. The Clauses are not the only ones who have benefited from help from elves over the years. 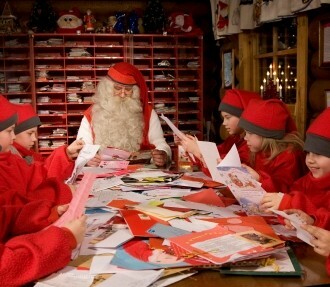 The tradition of household elves goes back to ancient times, more than 2,000 years ago. The household elf has always been the guardian spirit that protects the home, secretly or quietly. In Finland, such elves have always protected and assisted the inhabitants of country dwellings. They heated saunas, tended the children and saw to the grain, the cattle and the horses in the stable. They were best friends with the dogs and cats. Elves were also very attached to the old buildings in which they lived. People appreciate elves and give them food in return for their services. In many homes a bowl of rice porridge is put aside on Christmas Eve, and strangely enough, it’s always empty in the morning.